At this very special time of year, Christine and I want to wish each of you happy holidays and a new year full of good health, abundance and happiness. Thank you for support and friendship over the years! The “Dinosaur” series is one of Lino’s signature series. This particular example is elegant and has great movement. Its graceful lines and rich coloration make for what I can only call a masterpiece. This new piece by John Kiley is part of his new white series. The concept of a white exterior and an interior color, or combination of colors in this case, is very sophisticated and fits perfectly with the sculptural sensibility of John’s wonderful work. One of my favorite series by Nancy is the “Cloud” series. I love these organic, puffy forms. The rainbow colors of this particular piece make it one of the most dynamic and dramatic Callan works that I’ve seen. If you know Nancy, you will probably agree that it fits her vibrant personality. Jose Chardiet says, “My goal is to create sculptures imbued with a spiritual and inner life. Using the natural transparency and translucency of the material allows the viewer to look beyond the surface, to get to the core or soul of the sculpture”. This beautiful new piece, which combines glass with metal, certainly lends itself to this concept. We see the piece, we appreciate the elegant form and the subtle colors, and then we begin to look into the piece, through the piece and perhaps experience a moment of inner quiet, a respite from our sometimes overly busy lives. 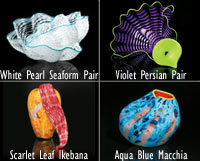 I could not resist the temptation to show Chihuly’s 2012 Studio Editions one last time. Each one typifies one of Dale’s well known series and each one is a gem. Once again, Happy Holidays and New Year!